Graduate College of Education student Emily Rodriguez explores resources in the Cahill Learning Lab. California has a serious teacher shortage in its public schools. The ratio of students to teachers is now about 30 to one, according to the California Department of Education, and the number of credentialed teachers coming from the state’s colleges and universities is not keeping up, with approximately 10,500 graduating annually to fill nearly 20,000 openings. For comparison, the latest numbers from the National Center for Education Statistics indicate that the national ratio of students to teachers was 16 to 1 in 2013. 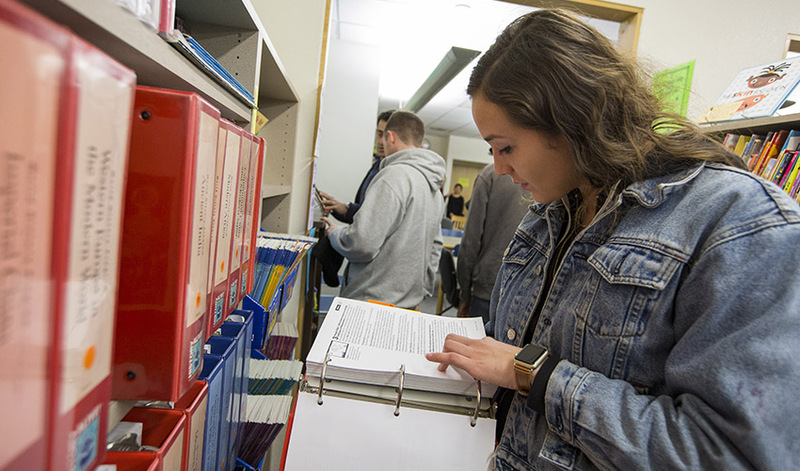 “In recent years, the state has been facing an increasing shortage, projected at about 10,000 credentialed teachers for the coming year,” said Robert Williams, associate dean of San Francisco State University's Graduate College of Education. And with California’s population becoming increasingly ethnically diverse, there is an urgent need for more teachers who represent that diversity. For example, the California Department of Education reported that in the 2016–2017 school year, Hispanic students represented 54 percent of the school enrollment while only 20 percent of teachers were Hispanic. Research studies have documented positive academic effects from having teachers of diverse ethnic backgrounds that reflect the diversity of the students. Nancy Robinson, interim dean of the Graduate College of Education, notes that California is one of the few states that has required prospective teachers to complete a bachelor’s degree in addition to a credential program. In 2016, SF State received two grants from the California Commission on Teacher Credentialing to create an integrated, four-year credential program. The funding is helping SF State develop a B.A. in kinesiology with an integrated credential in physical education and a B.A. in liberal studies or child and adolescent development with an integrated Multiple Subject Credential with the option of bilingual authorization. Robinson says the college is invested in social justice and equity and building quality teachers. She stresses that financial assistance is available for students who want to give back to their communities by becoming a teacher. “We have many scholarship opportunities in this college. There is money to help students continue their programs and to ease the financial costs,” she said.